Shortly after smart phone became popular, someone realized that the built-in camera could do more than just take photos, and the scanner app was born. Scanning on the iPhone has become so popular, that Apple recently added it as a feature in the Notes app. But if you do more than the occasional document scan, a smart phone app may not meet your needs. For doing a higher volume of portable scanning and for better results, check out the Epson Workforce ES-50 Portable Document Scanner. Compact design for easy transport. No USB-C Cable included. USB powered, no AC needed. Like the scanner itself, the packaging of the Epson Workforce ES-50 Portable Document Scanner is minimal. In the box was the ES-50 scanner, a USB 2.0 connection cable, a cleaning sheet, a calibration card and a Start Here Installation Guide. That’s it. We found the Start Here Guide more than enough to get up and running but for anyone unfamiliar with Epson hardware and software, or if you just want a lot more detail, Epson provides a 112-page User Manual on their support site. You can download a copy of the complete User Guide here. The scanner itself is wrapped in a protective plastic and there is a piece of thin cardboard in the scanner channel, also for protection. On the side of the scanner is the micro USB connection for the included cord, which also has a standard USB-A plug on the opposite end. For anyone with a newer Mac, you will need to make an accommodation to connect to your USB-C port. Check out our article “You Just Got a New Apple Laptop – Now What?” for some connection solutions. You can read the complete article here. Installation of the software was quick and easy. After downloading it from the Epson site, we launched the Installer package and it took care of itself. From the time we opened the box to making our first scan was about 10-minutes. Aside from connecting the scanner to your computer, the only control is a single button to start the scanning process. The Epson ES-50 is a one sheet, single pass scanner meaning you can only scan one side of a page at a time. This is one of the smallest scanner’s we have seen. It measures a mere 10.7” x 1.8” x 1.3” and weighs just 0.59 lbs. You can easily slip the scanner into a messenger bag or into a larger laptop sleeve, so you always have it with you. The scanner uses a Color Contact Image Sensor (“CIS”) and a 3-color RGB LED light source. It has an optical and hardware resolution of 600 dpi with a maximum resolution of 1200 dpi available. The ES-50 won’t win any speed tests with a scanning speed of 10 pages per minute. However, if you have ever used a scanning app on your iPhone, you know that it takes time to focus on the document, find the edges and then, usually do some clean-up. All of that take time too and, in the end, the Epson ES-50 winds up being much faster than most of the scanning apps we have used. The Epson ES-50 and the currently available works on all version of macOS 10.11 and above and we had no issues using it on our 2017 MacBook Pro running macOS Mojave. We were pleasantly surprised at the results we got from the Epson Workforce ES-50 Portable Document Scanner. Scans were crisp and clear in both color and black & white. The Epson Scan software is the same version we have seen in the other recent Epson scanners we have reviewed, like the FastFoto – FF680W, (read our review here), and the Epson Workforce ES-500WR Document Scanner (read our review here), and gives the same great results. The one exception is that double sided documents need to be scanned twice, once for each side. The Epson Workforce ES-50 Portable Document Scanner also performed well in scanning credit card sized objects. This would be particularly handy if you have a need to scan things like driver’s licenses or health insurance cards on a regular basis. 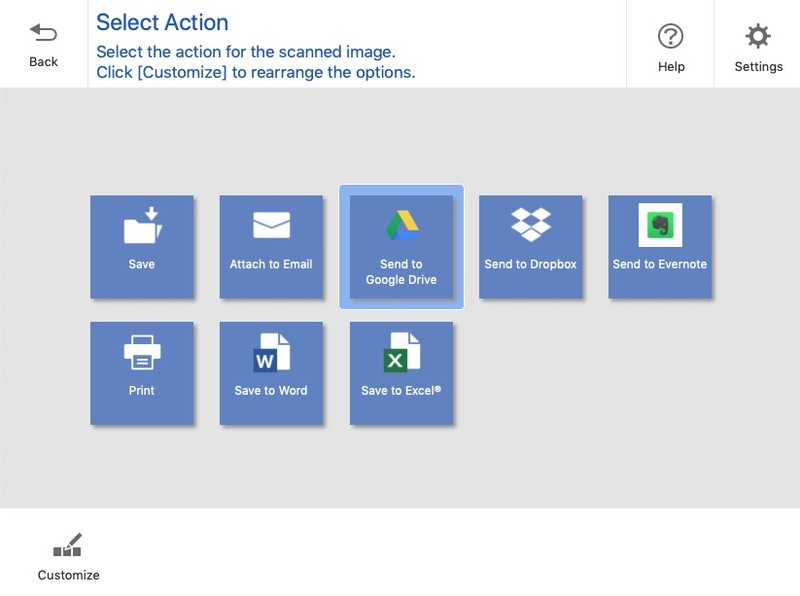 Like the larger Epson scanners, the ES-50 and the Epson Scan Smart software still gives you the option to scan to a cloud service like Google Drive and Dropbox, directly to email or to Word and Excel using the included Nuance OCR software. There is even an Automatic Feed Mode, controlled by the software, that eliminates the need to press the Start button for each page when scanning a multi-page document. The software pauses while you insert the next page and then automatically continues the scanning process. This is a big benefit for even a single two-sided document. While some people may feel that the USB 2.0 connection is outdated, it was more than enough to meet our needs. The scanner did not lag and because the USB cable is the only connection required, we can scan an unlimited number of pages. For people that only occasionally try to scan a document, an app on your phone or the Notes app included with iOS may be enough to suit your needs. But if you are a road warrior, or just someone that needs to scan documents on a regular basis, an app may not be good enough. You should consider the Epson Workforce ES-50 Portable Document Scanner. With its USB power you have unlimited scanning capacity with a single, simple connection to your laptop. The small size of the scanner makes it easy to transport or stay on the corner of your desk without getting in the way. 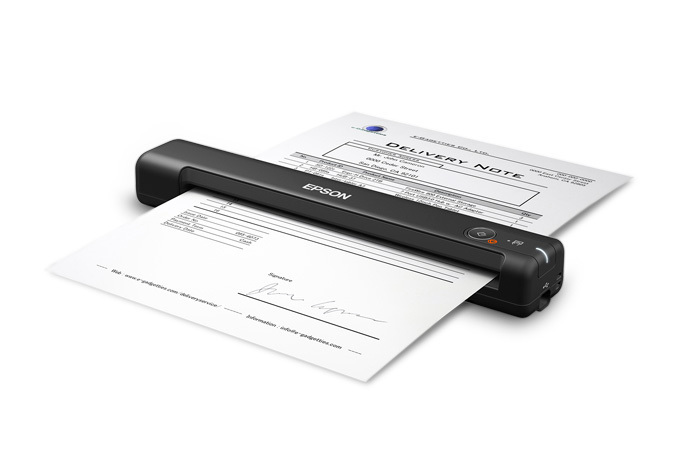 In addition to the ES-50, Epson offers the Epson ES-60W Portable Document Scanner. The physical size of the ES-60W is identical to the ES-50 but has a built-in battery and connects to your computer using its own wireless network. It still has the USB connectivity if needed. Some people may prefer the ability to scan wirelessly but keep in mind that the internal battery will need to be recharged periodically which adds a little more maintenance compared to the ES-50. You should expect the same great results from either model. The Epson Workforce ES-50 Portable Document Scanner comes with a one-year manufacturer’s warranty and has an MSRP of $119.99 and is available from Amazon. The ES-60W has an MSRP of $159.99 and is also available from Amazon. We would like to thank our friends at Epson for providing the Epson Workforce ES-50 Portable Document Scanner for our testing and review. Do you do a lot of scanning while on-the-go? Do you prefer to use a portable scanner, or do you have a favorite app on your iPhone? Why not join the conversation and leave a comment below?